Yes a big thanks to Dave632 for putting on a great event congrats to all racers my car has now gone the fastest it has ever gone must like the 30 amps. Wow! Quite the upset! Congratulations Sandfly on the win!!! A big huge Thanks to Dave632 for the great racing and documentation! Feeling fortunate that the Camaro Jungle Jim did as well as it did! So glad to be a part of this, Thanks everyone!!! 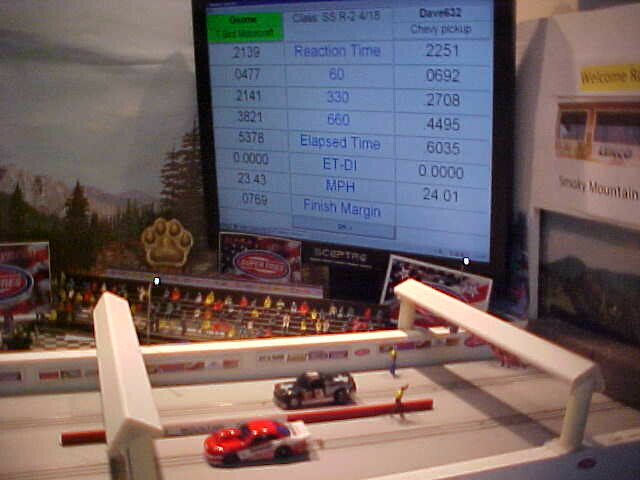 This class showed how the cars seem to vary in performance from day to day and even run to run. It keeps it interesting and you never know how it will turn out. 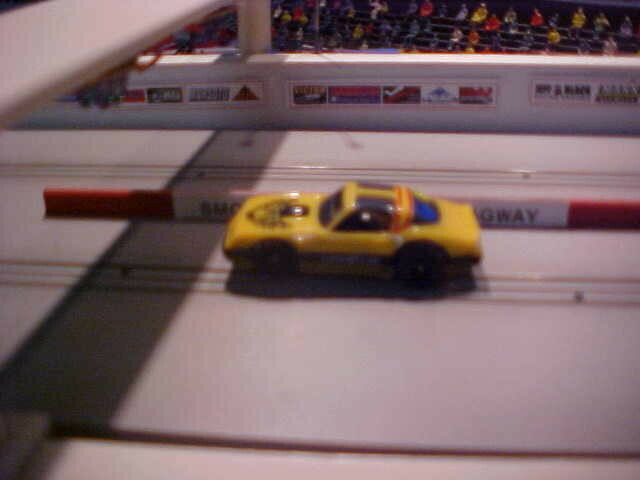 A couple of the cars hesitated on the line literally giving the race away to their opponents. If you look at the victory margin in some of the races you can see where that happened. Another thing that is very important besides horsepower is the low end acceleration. Many cars had good MPH but were lacking in the early stages which made a huge difference in ET. round 2 thru to the final. Congrats to Sandfly for your Victory ! Dave your doing a awesome job and Thank You for putting on this race. A very impressive turn out and some really nice cars. Good Luck to everyone today !! Low ET Hairy Canary gets the bye in this round. First up is JJwallace vs KiwiDave. JJ takes the win with a strong .5220 24.61 for the Dodge over the .6636 19.05 of Kiwi Daves Willy's. Dodge getting the early lead and the Camaro making a charge at the finish closing the gap, not enough room to catch up however. Bill some traction magnets would help. JJWallace gets the bye run. 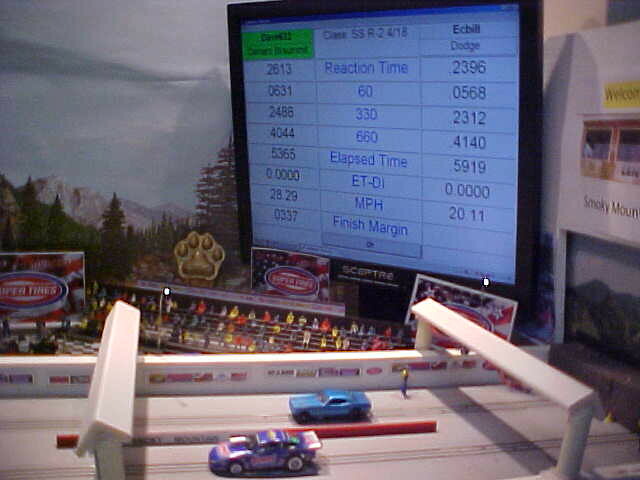 another strong run .5172 26.22 to take out the good .5980 19.15 for the Dodge. 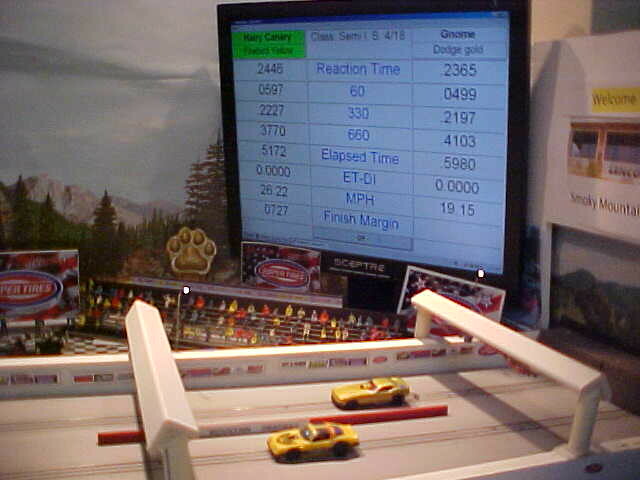 This sets up the final between the #1 and #2 cars. 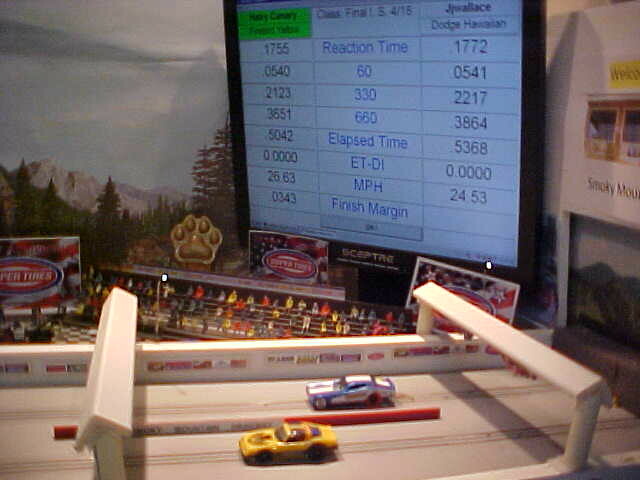 The cars leave together and stay close to the 60' mark then Hairy Canary's yellow rocket powered by a super G+ chassis starts to pull away from the Dodge powered by a Jag DR chassis taking the win with it's best time of the meet turning a .5042 26.63 over JJs strong .5368 24.53, great final and exceptional performance from inline stockers. CONGRATULATIONS TO HAIRY CANARY FOR WINNING THE INLINE STOCK CLASS AT THE SMOKY MOUNTAIN SPRING NATIONALS. Sorry about the picture quality something has gone wrong with the auto focus on the camera. Time for a new camera. Low ET JJWallace gets the bye for this round. 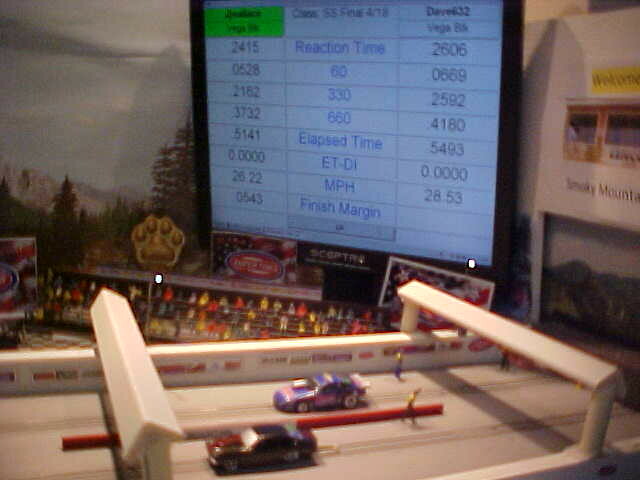 First up is Dave632 and his late model Camaro powered by a Jag DR chassis vs ECBill and his Dodge also powered by a Jag DR chassis. to watch as the Camaro had to make up some distance to catch up. 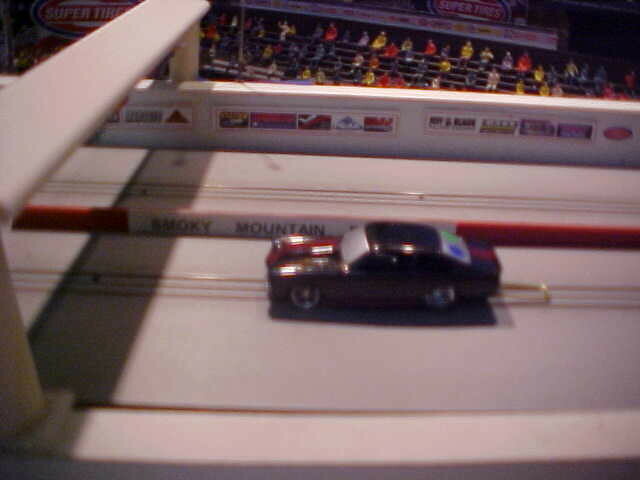 Next up is Gnome and his super G+ powered Motorcraft T bird vs Dave632 with his Tyco powered Chevy pickup. 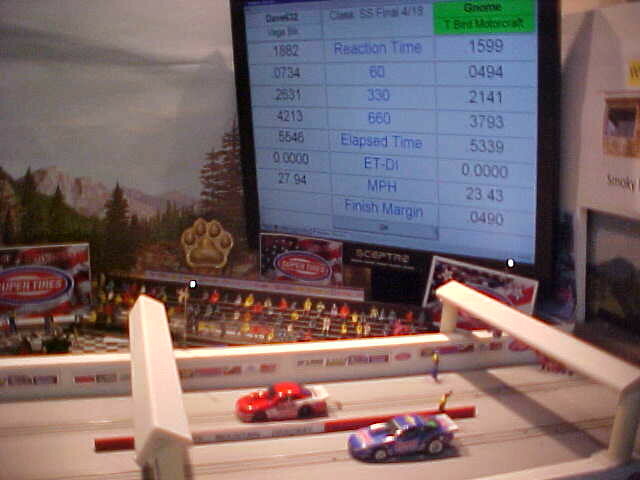 This one is a no contest as the T bird gets the hole shot and pulls away to the 660' where they run to the finish. 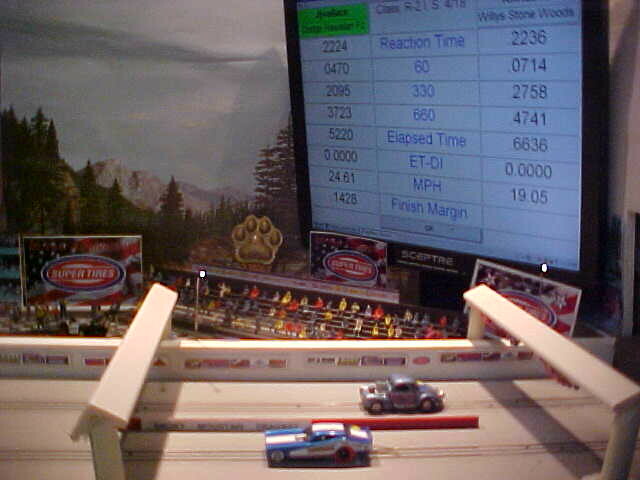 The T bird ran a .5378 23.43 to the Chevy's .6035 24.01. Dave632 gets the bye in this round due to a .0013 better ET than Gnome. Think I would like to see that race after the final. 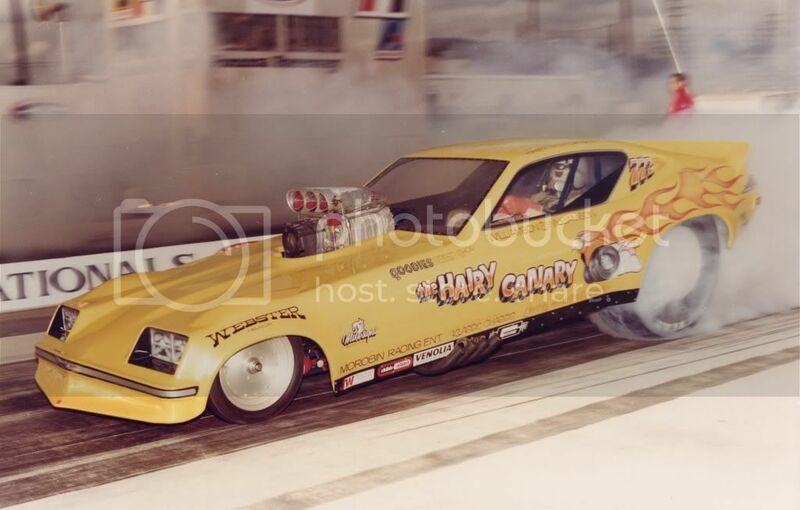 JJWallace and his DR powered Chevy Vega vs Gnome and his super G+ T bird. 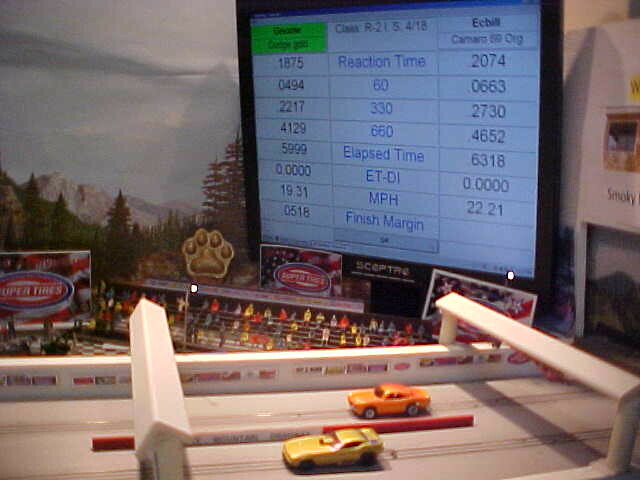 Vega catches up by the 330' and edges ahead for the win running a strong .5196 26.03 vs .5336 23.35 for the T bird. They line up for what should be a good race. work. 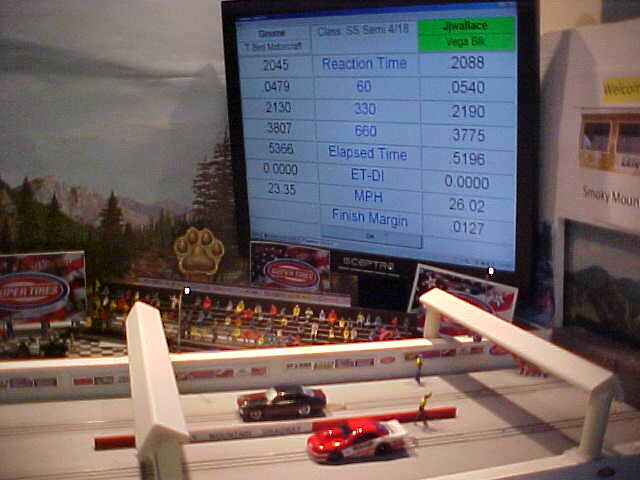 The Vega runs a .5141 26.22 vs .5493 28.53 for the Camaro. CONGRATULATIONS TO JJWALLCE FOR WINNING THE SUPER STOCK CLASS AT THE 2018 SMOKY MOUNTAIN SPRING NATIONALS. Here is the promised run between the Camaro of Dave632 and the T bird of Gnome. Well this was a disappointment, the Camaro spun the tires at the start and the race was over right there. Once again sorry for poor focus. New camera coming. round 2 thru to the finals. Congratulations to Hairy Canary for his Inline Stock win and Jeff for his Super Stock win!